And so are some wonderful deals from Amy and Bernina! All of our floor model machines are priced to sell. We are expecting more machines soon, and these must go. 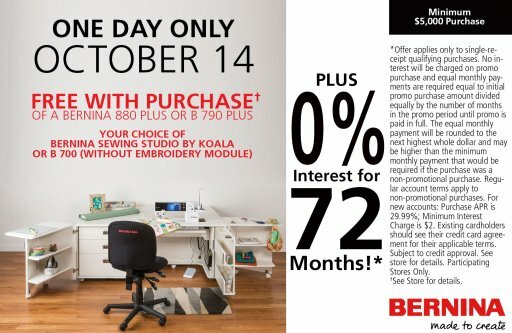 And to make it really easy to purchase, Bernina has a one day only financing offer – 72 months interest free!!! (That is 6 years of “free” money – hard to get a better deal than that.) And, there are special promotions for the 790 Plus and 880 Plus machines. The foot of the month at 25% off is the "ruffler". Since they are machine specific, we do not carry them in stock but would need to order it for your machine. Just come/call in and pre-pay and we will get it ordered for you. This is a fun foot that is handy for a number of uses. OESD FALL BUNDLE SALE!!!! This is a wonderful deal for all my embroiderers. ANY OESD sell totaling $79 or more (monthly for Oct, Nov & Dec) gets you a free CD of holiday patters/motifs. There are 3 different ones and they are sooo cute! We have catalogs available and if we don't have what you want in stock, we will let you pre-pay and we will order it and count it toward your sale. Need that Christmas Village collection piece? The Diner is the new 2017 addition, and now is the time to get it! The Bundle It Up sale was so popular Amy has decided to continue it through December on the fat quarters and the QS rulers. FQ bundles are purchase 8 and get them for $25 and you select the FQ’s you want that are pre-cut. On the QS rulers everyone is raving about, she is giving a 20% discount if you purchase any 3 or more at a time on the 3rd and additional rulers – so stock up! We will order any sizes you don’t have and we have a list of them and skews to ring them up at the register. Hickory Hill Halloween Spooktacular Event! Tuesday, October 31, come in wearing your Halloween Costume/Attire and get 10% off anything on the floor (except machines which are already marked down). If items are already on sale - you get 10% off in addition to the sale price! Mastery classes are now available the first Saturday of every month. They are divided between morning classes and afternoon classes. Be sure to tell us which classes you want (or both, if you wish) when you call in to reserve your spot. Our mastery class policy has changed. 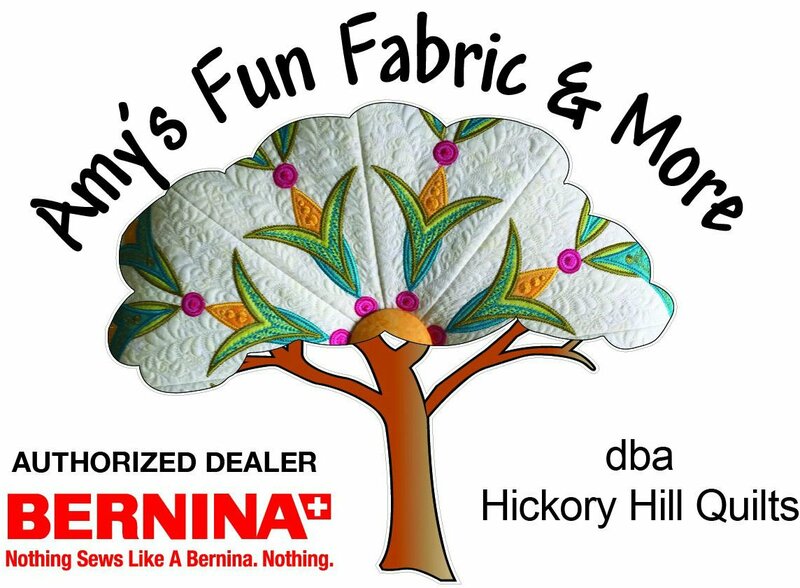 The classes are available to all Bernina owners at no charge. If you purchased your machine from someone other than Hickory Hill Quilts, you are still welcome in our classes. Come in and talk to us about “adopting” your machine, so that we can provide your classes and warranty work for you. Thursday, October 26, Michelle will teach another session of Basic Free Motion Quilting with rulers. This is always a popular class, and usually fills quickly, so call now to reserve your place. Saturday, October 28, is time for Ruler Club! As always, if you would like to learn a little more about free motion ruler work, or have questions about a specific ruler, this is the time to get that information. This will be the last Ruler Club of this year, so if you have a ruler or template you need help with, now is the time! Monday, October 30, Barb will be teaching “Edge to Edge Quilting using your Embroidery Machine.” This class has been requested by many of you in the last year. This was really popular when it was first taught a few years ago, and the popularity has not decreased. Barb will show you how to quilt your own quilts with all-over designs using your embroidery machine and software by Amelia Scott. If you are wanting to do your own quilting easily, instead of sending them out to a long-arm quilter, this class is for you. Friday, November 3, Michelle will teach a super easy holiday table runner. It is a quilt-as-you go, and the pattern is included in the class fee. It is always fun to go home at the end of the day with an almost-complete project – everything but the binding! Wednesday, November 8 will be Judy Bowers' first “Twinkle Star” class. It is an ideal beginner class for learning the Judy Niemeyer paper piecing techniques. The class project is already kitted – it will make a gorgeous holiday wall hanging or large table topper. The second half of this class will be the following week, November 15, so you can have this done by Thanksgiving – and it is so stunning! Our repair shop is up and operational, manned by Skip Hoyt. He is working really hard at getting the back-log that developed over the summer all completed, and looking forward to being our support technician. Thank you, Skip! Our new embroidery business is up and running! Barb and Amy have everything organized and ready to go to provide any embroidery needs from the community. Please help us spread the word – anyone who needs caps, shirts, jackets, etc – we are happy to work with you! Gift Certificates: Anyone who has earned a loyal customer gift certificate in the last few months has discovered that our new point of sale tracks those gift certificates for us – no paper certificates for us to write up, or for you to try to track! It is also a much better situation for the accounting end of the business. After the end of the year, we will no longer honor the old paper certificates, so please, please, please – bring them in and redeem them soon. The rewards program isn't changing, just the method by which we track your rewards. The old thread card reward system will remain the same, however, as our system isn't quite up to the task of tracking your thread purchases at the level of detail we need.